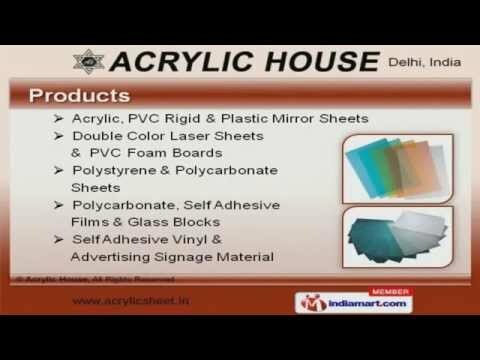 Welcome to Acrylic House, Supplier of Plastic Sheet and Advertisement Signage Materials. The company was incorporated in the year 1990. Our Transparent business dealings and Strong financial position make us unique in the industry. Vast industry experience, efficient logistic facility and variegated payment options make us the first choice of our clients. We offer a diverse range of Double Color Laser Sheets, Self Adhesive Vinyl and Advertising Signage Material. Acrylic, PVC Rigid and Plastic Mirror Sheets are best in terms of quality. Double Color Laser Sheets and PVC Foam Boards offered by us are well known for their durability and reliability. We also provide Polystyrene and Polycarbonate Sheets that are available at industry leading prices. We are instrumental in offering a wide array of Polycarbonate, Self Adhesive Films and Glass Blocks that are a class apart. We are a leading firm engaged in offering Self Adhesive Vinyl and Advertising Signage Material that are acknowledged for their functionality.